Mary Ann Hart obituary. Carnes Funeral Home. 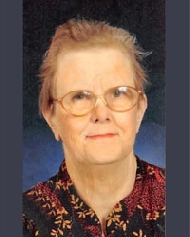 Mary Ann Hart,(Mimi),75, of Houston, Texas, passed away November 19, 2015. Mary is predeceased by her husband of 56 years John W Hart and her son John Jr.
She is survived by her daughters Kathy Hart and Tina Tudor. Mary had four grandchildren, Brian Hart, Jeremy Salinas, James Hart and Kristi Moreno. She had six great grandchildren, Nathan, Maya and Julian Moreno, and Skylee, Ivee and Hunter Hart. A Memorial Service will be held at 2:00 pm Saturday, November 28, 2015 in the Chapel of Carnes Funeral Home, 1102 Indiana St., South Houston, TX 77587.